Michael Shinagel has collated the reprint with all six authorizededitions published by Taylor in 1719 to achieve a text that is faithfulto Defoe's original edition. Annotations assist the reader with obscurewords and idioms, biblical references, and nautical terms. "Contexts" helps the reader understand the novel "s historical andreligious significance. Included are four contemporary accounts ofmarooned men, Defoe "s autobiographical passages on the novel "sallegorical foundation, and aspects of the Puritan emblematic traditionessential for understanding the novel "s religious aspects. "Eighteenth-and Nineteenth-Century Opinions" is a comprehensive studyof early estimations by prominent literary and political figures,including Alexander Pope, Jean-Jacques Rousseau, Samuel Johnson, SamuelTaylor Coleridge, William Wordsworth, Edgar Allen Poe, Thomas BabingtonMacaulay, Charles Dickens, Karl Marx, and John Stuart Mill. "Twentieth-Century Criticism" is a collection of fourteen essays (fiveof them new to the Second Edition) that presents a variety ofperspectives on Robinson Crusoe by Virginia Woolf, Ian Watt, EricBerne, Maximillian E. Novak, Frank Budgen, James Joyce, George A.Starr, J. Paul Hunter, James Sutherland, John J. Richetti, LeopoldDamrosch, Jr., John Bender, Michael McKeon, and Carol Houlihan Flynn. 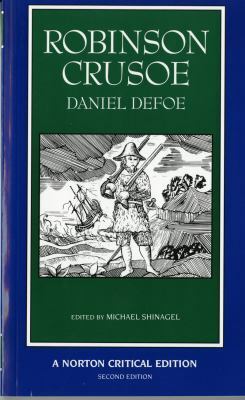 A Chronology of Defoe "s life and work and an updated SelectedBibliography are also included.Defoe, Daniel is the author of 'Robinson Crusoe An Authoritative Text, Contexts, Criticism', published 1993 under ISBN 9780393964523 and ISBN 0393964523.